Save the date for the 2019 Annual Conference, which will be held from May 14–17 at the Omni Orlando Resort at ChampionsGate in Orlando, Florida. Membership in PMBA gives you access to an extensive network of professionals and knowledge base of effective business practices. PMBA provides member stations with access to resources and a knowledge base that results in improved business practices and a better bottom line. Join PMBA’s member stations to access to public media business intelligence, resources, and training. 2019 Annual Conference—Registration Is Open! 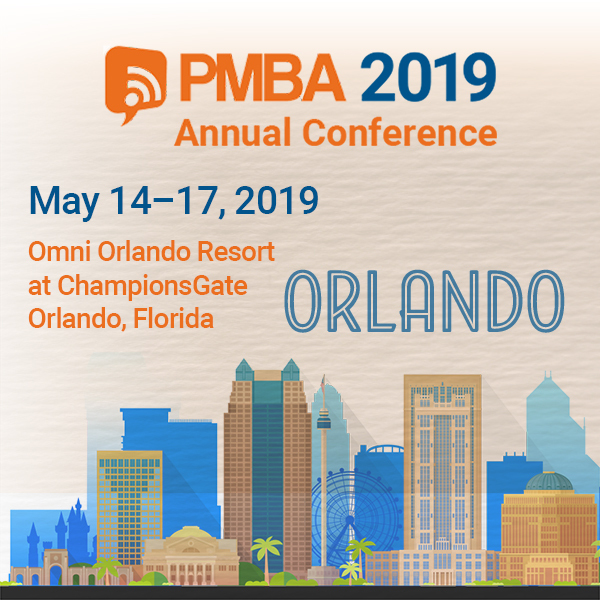 Join us at PMBA's 2019 Annual Conference from May 14–17 at the Omni Orlando Resort at ChampionsGate in Orlando, Florida! More information. Thank you to our 2018 Annual Conference attendees and sponsors who made this year's conference a huge success. The presentation handouts are now available to attendees and PMBA members—if you attended the 2018 conference or are a member and did not receive the handouts email, please contact us at info@pmbaonline.org.